I pulled up to The Lash Trap around 1pm, Sunday to find Ri$$a wrapping up her Lash Class. 5 eager girls just paid $400+ a pop to learn the ever so popular skill of lash extensions from one of the best in the industry. Safe to say she's a #GIRLBOSS! Who is Ri$$a? She's a 26 year old South Central Native, Entrepreneur, self motivated, authentic woman, with a hustlers go getter mentality. But lets not get it twisted, she's also an inspirational singer and artist whose music doesn't boast about carrying weight outta state for a man (although I love Lil Kim); but more along the lines of "girlfriend these men are trash...go out and get it yourself..I promise the right one will come along." Her most resent album, LONG STORY, SHORT, goes into detail on how to reach your highest potential, while avoiding all that is fuckboyism, while making money! Her cryptic "go get your money, sis" messages captured me as a fan -and once I met her in person- as a friend. Watch how she SLAYS the EAT x ELP Rose Gold Metallic Denim Mini Skirt, in her Album Release Party recap video! 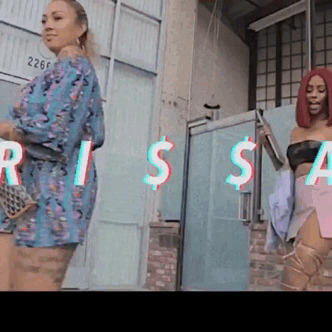 Head to Ri$$a's Website to Learn More about her and her journey!